When I am searching for a new bag the first place I usually look is Nordstrom because I think they have the best selection in the price range that I usually want to spend on a good bag. Nordstrom carries all of my favorite designers, so I know it is a one stop shop where I can compare all of my top picks. I am craving a new bag and these are on the top of my list. I am just not sure which one to get! Great picks! Love that striped Kate Spade one! Oooh...great picks! I think my favorite is the TB Lydia tote! I am loving ted baker at the moment, I feel they've really made a come back these past couple of years, especially this year some of their bags are bang on trend! Love that last Kate Spade clutch! In LOVE with that floral Tory Burch tote! Great bag selections. I'm in love with all of the Tory Burch bags! Great picks! I'll take the pink clutch. So cute! 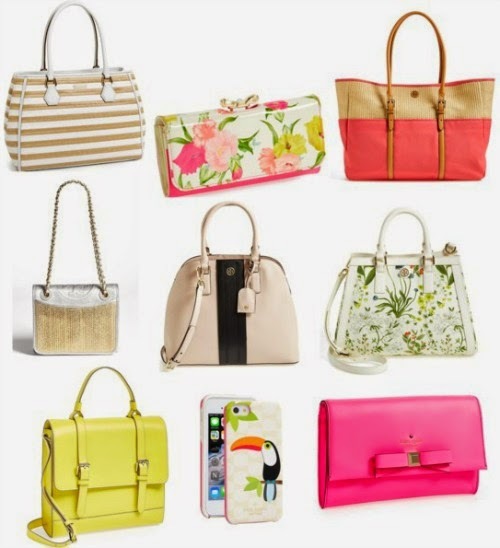 I am in need of a new spring bag as well, great options!! I love the Kate Spade clutch! Great picks! Love the Kate Spade Hot Pink clutch hoping to add that to my summer wardrobe!! In love with the last one on the 2nd row!! Love the middle Tory Burch. Just... love.